17. Lithostrotion mamillare vav. proliferum, Hall Plate I figure 4. Coral branching and having a tindency toward individual growth. Corally usually obconic; calyces rather deep. The center of each calyx bears a monticule which is surrounded by a flattened columnella. Septa numerous, the number in some [calyces?] being sixty. Geological position and locality, Saint Louis Limestone of south eastern Iowa. Reference Hall's Geology of Iowa, Vol. 1, Part II. In which the name Lithostrotion proloferum is given. 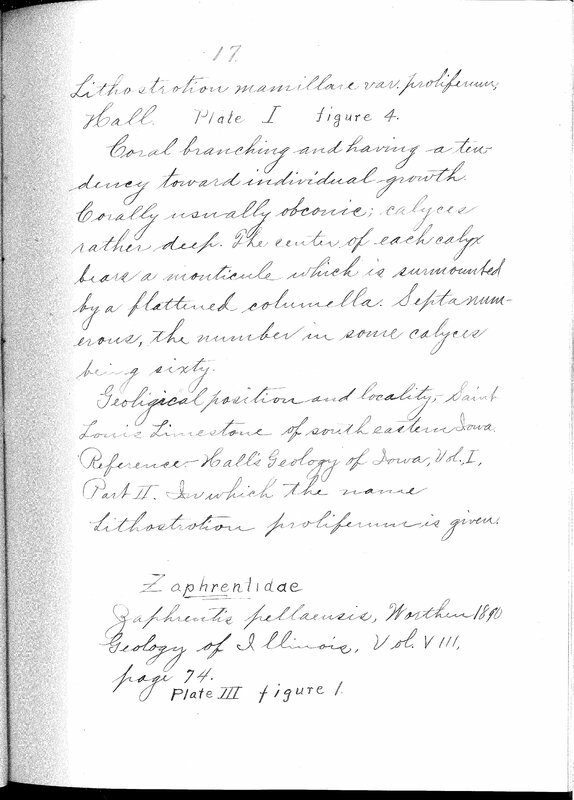 Zaphrentidae Zaphrentis pellaensis Worthen 1890 Geology of Illinois, Vol. VIII, page 74. Plate III figure 1.